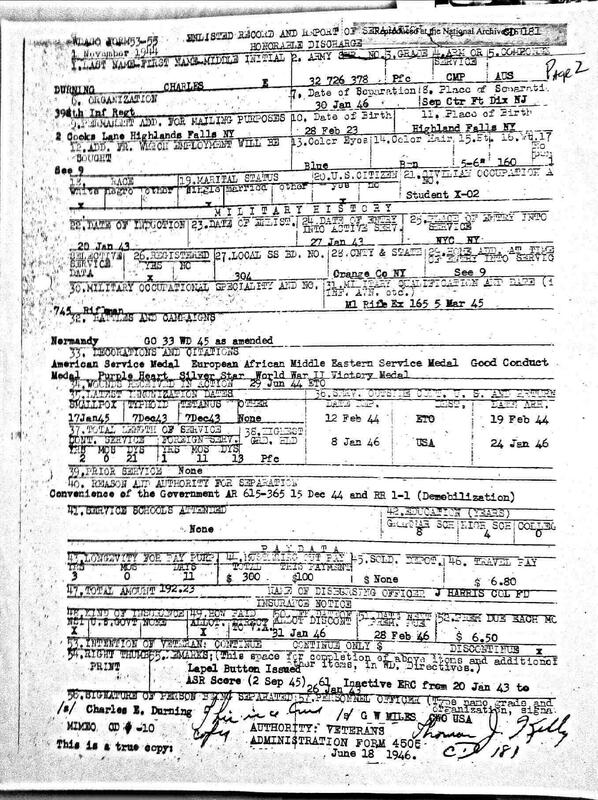 The 53-55 Discharge for WWII is a great source of information. But please remember that it is only a starting point. Just because it is listed on a 53-55 it doesn’t mean it’s correct. I’ve attached several examples of a 53-55 for your perusal. The 53-55 Discharge was the WWII equivalent of the later Form called the DD-214. The first examples are one from Charles Durning and Irving Schwartz. On Durning’s 53-55 Discharge it shows under Decorations and Citations Silver Star. That could mean a few things, one that it was a Silver Battle Star or the Silver Star Medal. To prove it was a Silver Star Medal you would need the General Order to prove it. Durning doesn’t have the General Order for that. 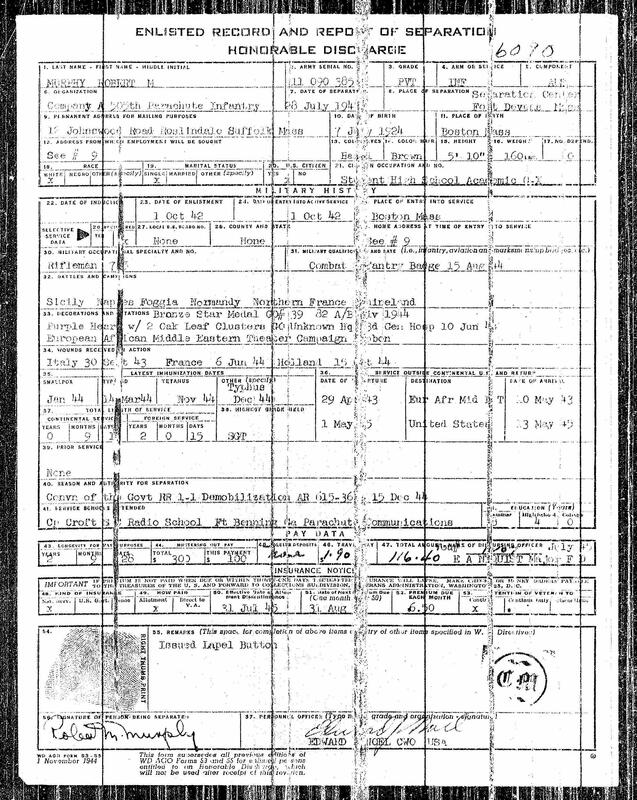 On Irving Schwartz’s 53-55 it shows that he was awarded both the Bronze Star Medal and the Silver Star. The difference between the Durning 53-55 and the Schwartz 53-55 is that Irving’s Decorations are supported by the General Orders. Durning had no documentation and without the documentation it means nothing. 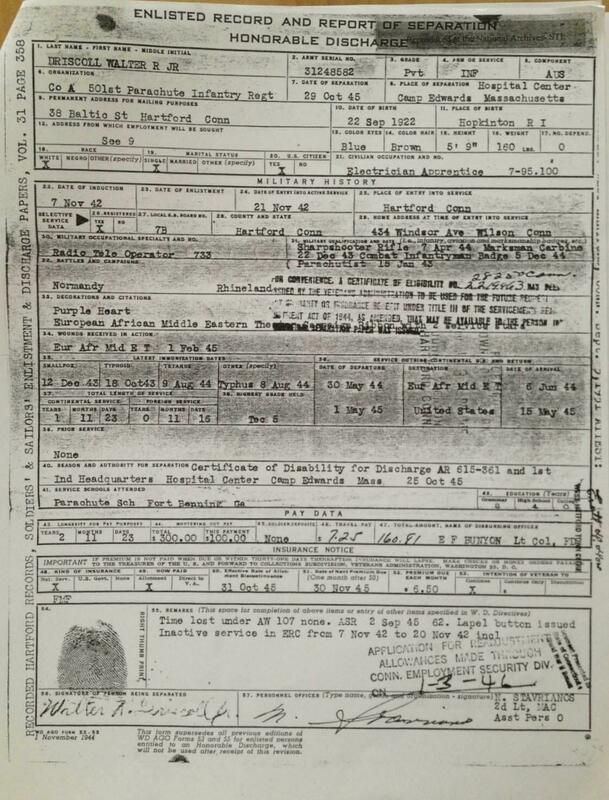 Schwartz’s 53-55 also shows he was discharged with his unit Co L of the 253rd Inf. As you will be near the bottom of the article not everyone went home with their unit. The next example of a 53-55 Discharge is for Robert Murphy. Murphy was awarded the Bronze Star Medal with documentation. But here is another example of a tired typist in 1945 and 1946. Under the section that speaks of Battles and Campaigns it shows Murphy being at the following ones; Sicily, Naples Foggia, Normandy, Northern France and Rhineland. Murphy was not in Sicily as he received his Combat Infantry Badge for the Italian Campaign which ran between 9 September 1943 and 18 November 1943 while Sicily ran between 9 July 1943 to 18 August 1943. Then to compound the error he is listed as being Northern France Campaign. That ran between 25 July 1944 to 14 September 1944. Murphy and the 505th Prcht Inf was in England during that entire time period. So once again another group of errors on a 53-55 Discharge Document. The next 53-55 Discharge error is from Walter Driscoll Jr. Under Battles and Campaigns it has him as being in Normandy. Only one problem with that, Driscoll didn’t get to England unit 6 June 1944 from the USA. This means his Combat Infantry Badge is for the Rhineland Campaign (Holland). It shows on this Morning Report Driscoll joining Company A of the 501st Prcht Inf at the end of July 1944. The last 53-55 example is a correct one but yet shows that even then it doesn’t show the whole story. Frank Schier was in the 8th Inf Div between December 1943 through the end of the war. After since he had enough points to return home he was transferred to the 507th Prcht Inf for the boat ride home. Since the 507th Prcht Inf was going to be disbanded upon arriving home in the States the men with enough points for the 507th Prcht Inf men were sent home. Since there was a lot of space in the 507th Prcht Inf other soldiers were transferred in to go home. 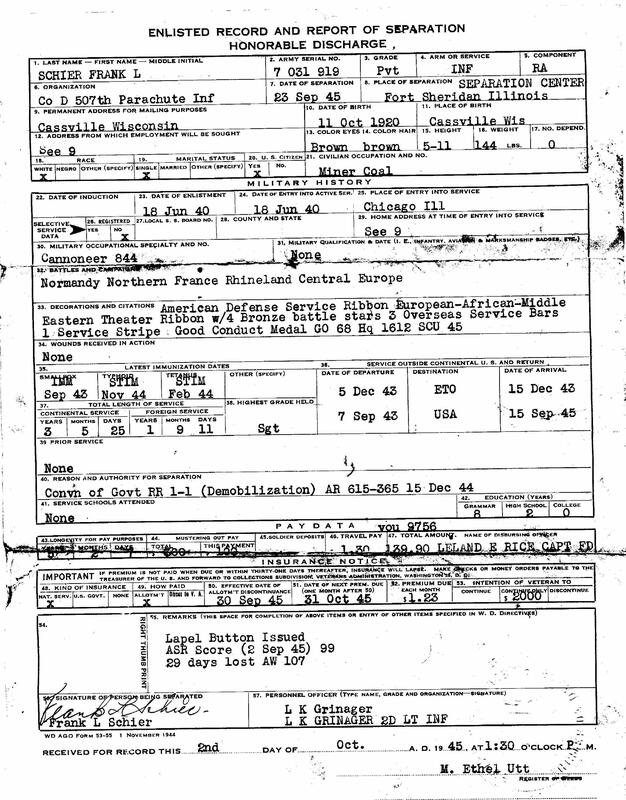 Frank Schier discharge shows 507th Prcht Inf Co D as that was officially his unit when he was discharged. A lot of 504th Prcht Inf and 505th Prcht Inf men were transferred into other units to go home they were not happy. Some didn’t care at the time what unit it was as long as they were able to get out. Some made the typist put in the information they felt was wrong. Either way it shows that the 53-55 Discharge was only a start.